The boyband were presented with special discs after selling around eight million singles, three million albums and a million DVDs in less than a year. 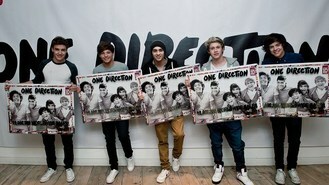 Their debut album, Up All Night, has topped the charts in 16 countries including the United States. Liam Payne said the band were "ecstatic and incredibly humbled" by the award. He said: "We have an incredible team of people around us who have helped us achieve this and above all we would like to thank our fans. We owe all our success to them." One Direction will perform at the MTV Video Music Awards in Los Angeles on September 6 where they are up for two awards, before embarking on a worldwide tour next year. The five members of the group met on the 2010 UK X Factor where they were defeated in the final by Matt Cardle.